Portsmouth striker Marc McNulty says their FA Cup fourth round tie against Bournemouth will be a chance to play against 'the country's best players'. 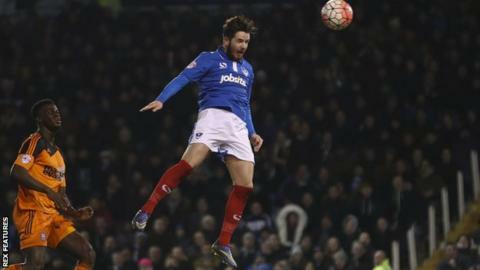 McNulty scored as Portsmouth beat Championship club Ipswich 2-1 in a third-round replay at Fratton Park. And League Two Pompey will host Premier League club Bournemouth on 30 January. "Everyone's excited, it will be a sell-out. It's not just exciting for the players, it's great for the fans too," McNulty told BBC Radio Solent. Portsmouth and Bournemouth last met in a competitive fixture in February 2013, when goals from Lewis Grabban and Marc Pugh gave the Cherries a 2-0 victory in League One. Since that match, the two clubs have gone on differing paths, but Pompey are among the contenders for automatic promotion from League Two. "That's the great thing about the FA Cup," Sheffield United loanee McNulty added. "You get the chance to test yourself against the best players in the country. "We're really looking forward to it, playing against a Premier League side is very exciting."